The 2012 IIHF Women's World Championship began Saturday in Burlington, Vt. Julie Chu from the United States team and Canadian team member Meghan Agosta blogged for NHL.com about their experiences during the tournament. Next to the Olympics, the world championship is one of the biggest tournaments in women's ice hockey. In the last few years, Canada has fallen short in the gold-medal game at the world championships and this year was the year to break that streak. Having a rough start to the tournament, our team needed to change a few things to even have a chance at gold again. With the help of a sports psychologist, and the preparation of the coaching staff, Canada got back on track after a tough beating from the United States. After climbing the ladder throughout the tournament, Canada was ready to face Team USA in the finals. Having goals set by head coach Dan Church, our team knew what we needed to do to be successful once the buzzer went. Leading 3-1 in the second period, things were looking great, but then Canada got into some penalty trouble and Team USA took advantage of it. Heading into the third period, the score was tied at 3-3. The United States scored early in the third with the go-ahead goal. Battle after battle and chance after chance, the United States took a penalty with three minutes left in the game. I tied it up to send the game into overtime. In OT, the U.S. gave Canada an odd-man rush. 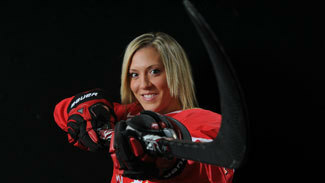 Tessa Bonhomme went hard to the net and with a pass from me and Caroline Ouellette scored. Canada wins! Wow, what a feeling. The losing streak was finally over! After the game, Team Canada was asked to be honored at the Ottawa Senators game Monday, April 16. Ottawa will be hosting the 2013 World Championship, and what a great way to promote next year's games. Dan Church, Gillian Apps, Courtney Birchard, Caroline Ouellette and myself represented the team as a part of the ceremonial puck drop. The building was packed and it was a sea of red and white. The atmosphere in the building was unbelievable, and there is no doubt that Ottawa will put on a show come 2013. Team Canada would like to thank Eugene Melnyk, and the whole Ottawa Senators organization, for this great opportunity. The city of Ottawa is first-class, and there is no doubt that the 2013 World Championship will be the best of the best.